← We Can Give Feedback, But Do We Know How to Receive it? Lawyers are a self-critical bunch – too self-critical sometimes! I consistently hear lawyers saying ‘I’m no good at selling’ or something similar. This is where the world of ‘the inner game’ and tennis coaching comes in! 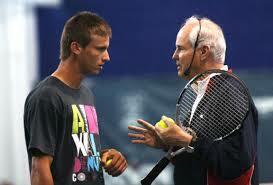 One of the most important coaching books ever written in my view was Tim Gallwey’s book, The Inner Game of Tennis. Not only did it start a trend in sports coaching but it effectively created a whole new industry – executive coaching! Let’s start by summarising Gallwey’s key propositions. You can imagine being Self 2 and feeling your confidence sapping and your tension rising. Not conducive to playing well. Frustration builds. The answer to address this problem lies in quietening this Self 1 dialogue and trusting your Self 2 to deliver. Imagine being a top tennis player and returning a serve from a fast server. The ball takes less than half a second to get to you. There’s no time to think about where to put your feet and the angle of your racket. You just have to trust that your body knows how to do it….and then just do it! One helpful way of quietening Self 1 is to let go of being judgemental. Avoid criticising yourself or imagining others criticising you. It’s still important to notice what’s going on, but see it happening as a neutral person and avoid either criticism or praise. You might be surprised to see me writing ‘avoid praise’. The reason this is important is because the absence of praise then easily becomes the equivalent of criticism. So, quietening Self 1is like becoming the neutral umpire rather than being a partisan player. So many senior lawyers telling me that they don’t know how to do it. ….and so the pattern and cycle continues…. Leading to: A calmer disposition and greater capacity to observe and listen and adapt as required. A greater chance of success! Junior partner grows up – A partner who had been at the firm since being a trainee lacked credibility with other partners and clients. He just wasn’t getting involved in the big deals and selling big ticket work. The coaching revealed that the partner was overly conscious that, though he was a partner, he felt he was only a junior one! That was his inner voice getting in the way of being effective. If he stopped talking there might be silence and that would be embarrassing! If the partner allowed the client too much airtime, the partner might not have the ability to shine! Our coaching focussed on the art of conversation and questioning and listening skills. These were skills that the partners had in ‘real life’ and when the partner looked at these lunches differently, they went much better. Senior Associate becomes a Human Being Again – it became obvious during a BD workshop I was running that one associate ‘changed’ when doing the role-play exercises and became less effective at building a relationship with the actor playing the client. Instead of being warm and friendly, as he was during a conversation during the coffee break, he became stiff and formal (which was how he was imagining a lawyer should be!). The ‘inner game’ was telling the associate that they had to be impressive. This led to too much tension and too little grace. When he imagined ‘just being himself’, it all worked much better. He listened better to the client and reflected back what the client was talking about. This entry was posted in Business Development and Selling, Coaching and Training and tagged Gallwey, inner game, non-judgemental, self 1, self 2. Bookmark the permalink.